You all aren’t sick of pasta or dinners by now, are ya? Good, because last week when I went to the grocery store, I noticed that pasta was on sale. The whole “Buy 4 for $3.00 package” dream come true…or at least in my eyes. And I took kielbasa sausage too, $2 for one pound, seems like a fairly good deal to me, plus It’s a fun ingredient to alternate between our typical chicken or ground beef dinners. I’m not sure if many of you cook dinner with kielbasa/smoked sausage, but there are lots of things you can do with smoked kielbasa/sausage. So I thought maybe I could offer a idea that will inspire you to come up with totally new dinner. This recipe made dinner time a snap, it really is a throw together kind of meal because it all comes together in just one pan, and it does taste good and makes a lot! Conclusion – If You Are In a Hurry and have a big family, or hungry teenagers, this would be perfect, and it’s not too expensive to make either. Add olive oil to a 4-5 quart saute pan over medium high heat. Fry the smoked kielbasa and onions. Add chicken broth, tomatoes, heavy cream, pasta, and seasonings. Simmer for 15 minutes, or untill pasta is tender. Remove skillet from heat and stir in 1/2 cup cheese. Top with remaining cheese and cover until cheese is melted, spotty brown, and bubbly. Sprinkle with sliced scallions and serve. This only makes 4 large servings, so if you are feeding a larger group or want leftovers,I'd recommend doubling the recipe, it's well worth it! Enjoy! Made this tonight and it was really good! Super simple and full of flavor! Thanks for the yummy recipe! Hi Kitty! Thanks for the kind words and I’m glad y’all enjoy it! We are kielbasa fans so this would disappear quickly in my household! Made this tonight and it was YUMMY! I used the small penne pasta and a can of the diced tomatoes with peppers and celery. Next time I think I’ll leave out the cheese though, tasted it before I put it in and it was just as delicious! This looks like a great weeknight recipe that everyone in my family will like – thanks for sharing – pinned. Stopping by from Super Sat. link party. I made this tonight with a few modifications! I omitted the tomatoes, added some red bell pepper, and used Parmesan cheese instead of cheddar. It was delicious! Great to have a recipe that’s great as written or modified! loved this dish! Thanks For sharing it was a family hit! Oh my, this looks incredible! Definitely pinning this to try soon!!! Love the simplicity of this recipe. I had to modify to use ingredients on hand -subbed rotel &used a can of cream of chicken instead of cream. I do prefer parboiling the pasta first, but otherwise this is becoming a regular meal for me! I thought the same thing about cooking the pasta first. When I add raw pasta to anything it’s tooooooo starchy. Dear God! I read this recipe and thought it would be delicious just with the ingredients involved, however I had no idea how good this was going to be! I was absolutely stunned and how delicious this dish was. great meal!!! We make it once a week! Don’t cook anything with chicken anymore will it taste just as good,if I use beef broth instead ?? Cant wait to try this recipe.. Thanks !! This was amazing. I used diced tomatoes with green chilies; my 6 year old loved it and requested this another night. Can’t wait for my husband to get home to eat. Thanks Holly,I’m glad to hear that! Just ate– it was yummy PLENTY of leftovers ! This was so good! I used sundried tomato chicken sausage which went nicely with the dish. I also added extra milk and tomatoes and then thickened it with some cornstarch once the pasta was cooked to get more of an extra creamy sauce. I will definitely be making this again! I made this for dinner tonight and the family loved it! Hubby said it was a keeper recipe, which means, it was delicious =) I didn’t have canned diced tomato, so I just cut fresh ones up to meet the quantity and used linguine noodles because I didn’t have little noodles either. I added about two cups of extra water for the noodles to cook through. Otherwise I followed the recipe and loved it!!!!! I made this last night and it was fantastic. Very tasty. I will definitely be making this again! I used half & half In place of milk. Flavor was great. Awesome recipe Sarah! My daughter made this last night with gluten free penne….MMMMMM. Fabulous!!! Hi,Chas.You can use drain tomatoes. Pingback: My Favorite Things-Inspiration and Dinner Ideas - Chocolate Chocolate and More! Made this tonight and it was a big hit with all but one of my picky grandkids who wouldnt try it . the rest came back for seconds. Very quick and tasty! I switched it up a bit… I don’t like tomatoes so puréed them, added a can of peas and some cajun seasoning… Hubby loves it! Thank you!! Hi,Jody.Yes I drain the tomatoes.Happy baking! I didn’t drain them😭😭😭 isn’t it still going to turn out?!? This is my second night in a week making it. My boyfriend loves it!! It’s going to be a regular dish on the menu!! Tonight is the 2nd time I’m making this. It’s so delicious and my whole family loves it! Thank you for this recipe! great dish! I added a couple of TBS of homemade creole spices and it was delicious! Can you make in the crock pot or keep warm there? Hi Michelle, I didn’t try so i can’t help you with that. I think crock pot is great idea. This is a fantastic quick, easy and budget friendly meal. Like others, I added a few things like Italian spices, red wine & hint of sugar in order to tame that acidic taste from the tomatoes. This meals is full of flavour and will also be a regular on our weekly dinner rotation. OMG, juz made this today, it is soooo good! I followed directions exactly n at 1st I didn’t think it would turn out with the cream n tomatoes but adding the cheese brought it all around then adding green onions make it even better! Thank you for bringing this recipe to my page!!! I made this twice this week, once w kielbasa and the next w shrimp and andouille sausage….omg so delicious both times!! very easy and great for leftovers!! Made this for dinner and my husband loved it. My current obsession is making one pot pasta meals – this might be the best one so far! And it’s super easy. My kids loved it. I used chicken-apple sausage from Sam’s for the win! Made this tonight and it was great! Easy and a great meal for work left overs. Definitely will be making this again. Thanks for the recipe! My hubby LOVES kielbasa, but I’ve never been a big fan. Until now! This dish is absolutely amazing and my husband, one year old and I made this a weekly recipe! Made this dish just a few minutes again and I thought it was delicious. Made it for the family but some didn’t care for the sausage but loved the noodles and sauce mixture.I will definitely make this again just a single serve and store in freezer for lunch for work but I Loved it. Thank you. Made this for dinner and my family loved it – only variation was I added a tsp of cayenne pepper to the dish. My daughter took the rest to school for leftovers and asked I make the dish regularly. I love everything about this! Your pictures are so stunning! Great recipe. Already made it and it was perfect. 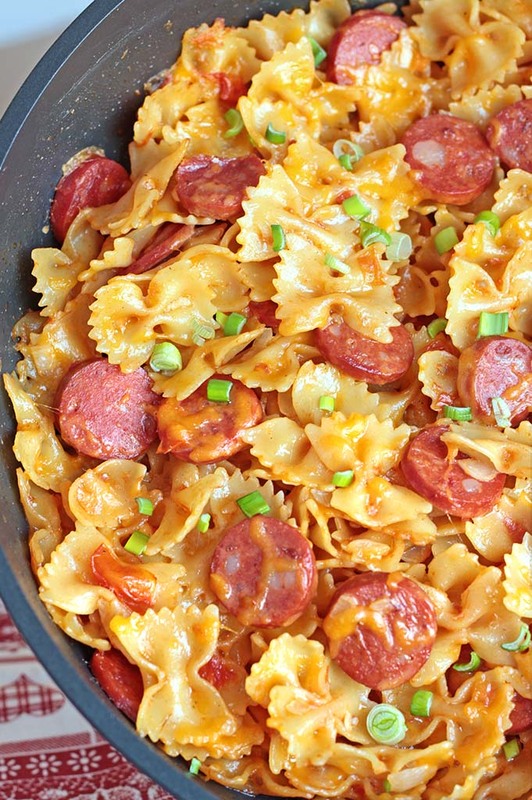 Thanks, for sharing this kielbasa pasta recipe with us. I added black beans to this recipe and I think it’s exactly what it needed. Try it!! Loved the idea of this recipe, but making again, I would def boil the noodles beforehand in a separate pot. Too starchy for me. Just made it tonight….. frankly logged it!!! I didn’t have any kielbasa, so I used spicy smoked sausage, added some pork chunks left over from dinner, used Rotel canned tomatoes, and added broccoli florets….. it looked so pretty!!!! It was so easy and by the time I let the pasta cook…. no more dishes in the sink!!! Thank you for an amazing recipe!!! I’d send you a picture, but it doesn’t allow me to add a pic!!! Thank you again!!!! I know you posted this like three years ago but this is legit my family’s favorite recipe. Husband asks for it all the time!! So good. I made this tonight, on the request of the teenager who had been scouring pinterest. I have added a whole container of baby spinached chopped up to it near the end (since spinach cooks quickly) With the flavors already involved, i think spinach will complement it nicely. I made this tonight. We loved it. Flavor was great. Only thing I will change next time is cooking noodles separetely. Quite a few didn’t cook right even though I did my best to make sure they were covered. Will make again. Very good. I used half the sausage and three different cheeses. I had small amounts of a Mexican blend and Pepper Jack and I used about a half cup of cheddar. We will make this again. This is so incredibly tasty! Thank you! Wow, this was really delicious! Super easy to make! I have a house of picky eaters , so I omitted the onions sans tomatoes. Like some of the other reviewers, I switched cheddar cheese for Parmesan. Super easy and delicious! Will definitely be making this again. I’ve made this many times for me and my daughters. Making it tonight for the husband and I hope he approves!! OMG YUMMM! This recipe was SO great, def a keeper and will be in heavy rotation. I cooked recipe as written but added some diced bell peppers and cajun seasoning. At the end of the time, i wanted my pasta a bit less aldente, so I added another 1/2 cup chicken broth and 1/2 almond milk to further let it cook. Just curious, are you supposed to cover it while cooking? It does sound really yummy!